After Petra Nova, what's next for NRG and carbon capture? Energy executives and government officials, including Energy Secretary Rick Perry, gathered southwest of Houston yesterday to celebrate the Petra Nova carbon capture project. Photo by Edward Klump. THOMPSONS, Texas — As a host of VIPs celebrated here yesterday, praising the Petra Nova project for capturing carbon dioxide from a coal plant and boosting oil output, one question went largely unanswered: What's next? It's too early to know, according to NRG Energy Inc., whose W.A. Parish power plant site southwest of Houston is home to Petra Nova. NRG is leaving the door open to further use of carbon capture technology, but shifting market conditions make any plans hard to pin down. 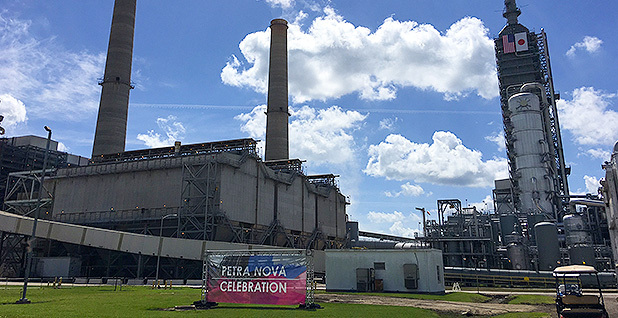 Petra Nova carried a $1 billion price tag and was operational in late December, thanks to the use of partnerships and about $190 million from the Department of Energy. Being able to say the project is on time and on budget is a bright spot for NRG, which has undergone a series of overhauls and may see further cost-cutting and asset sales. David Greeson, a vice president of development at NRG, couldn't speak to possible corporate changes. But he said getting beyond government help will be necessary for carbon capture and storage (CCS) to continue advancing. David Greeson, a vice president of development at NRG Energy Inc., said fluctuations in the price of oil affect Petra Nova's economics. Photo courtesy of NRG Energy. "The challenge is going to be how to figure out how to do one of these without government subsidies," Greeson said in an interview after Energy Secretary Rick Perry and Texas Gov. Greg Abbott (R) praised Petra Nova. "We doubt that we'll see unending government subsidy, like wind and solar have seen, in the CCS industry." The term CCUS also is used, meaning carbon capture, utilization and storage. That's because Petra Nova sends CO2 to enhance oil recovery at Hilcorp Energy Co.'s West Ranch oil field. Greeson said oil production there already has climbed from less than 300 barrels a day to more than 3,000 barrels a day. Oil is a key aspect of the plant because NRG gets some revenue from the field. "Since there's not a price on carbon, price of oil is everything," Greeson said. "So, yes, fluctuations in oil price does cause swings in the economics of the project." 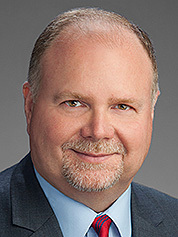 Greeson said investors get their money back with oil at about $50 a barrel. Oil at less than that could bring a downside, but higher prices could usher in better returns at Petra Nova. Benchmark U.S. oil was trading for around $53 a barrel yesterday, according to Bloomberg data. Some other high-profile carbon capture projects have failed to materialize or struggled along the way, including Southern Co.'s Kemper County Energy Facility. That project in Mississippi is different because it relies on gasifying coal. It has also seen numerous delays and is billions of dollars over budget. Greeson said Petra Nova's arrival "validates our approach to how to do a first-of-a-kind project" as NRG worked with partners to share risk. The project involves a carbon capture retrofit linked to a coal-fueled unit at W.A. Parish. News in 2 to 3 years? Now it's time for NRG to keep gathering information to see how Petra Nova performs, though market conditions and shifting priorities could influence decisions. "I would say that two to three years from now, we will be looking at possibly announcing the start of another project," Greeson said, adding, "There's a lot of technologies out there. This is not the only way to capture CO2." Texas Gov. 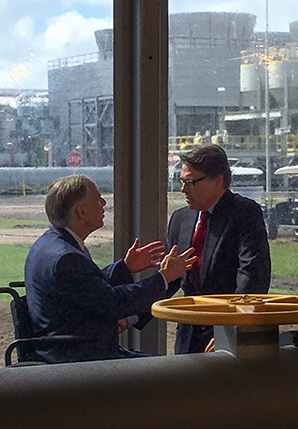 Greg Abbott (R) (left) chats with Perry yesterday after they both praised the Petra Nova project during an event near Houston. Photo by Edward Klump. Ed Hirs, an energy economist with the University of Houston, said this sort of carbon capture project may be "too little, too late" for coal, given the emergence of cheap natural gas for power generation. Not mining coal is the best way of sequestering the carbon, he said. "I don't think we'll see any more of these for coal-fired plants," Hirs said of carbon capture projects. "Potentially we could see them for gas-fired plants in the future." The Petra Nova project relied heavily on Japanese technology, consulting and financing. It's a joint venture between NRG and JX Nippon Oil & Gas Exploration Corp. Petra Nova relies on a process from Mitsubishi Heavy Industries Ltd. and Kansai Electric Power Co. The system extracts CO2 from flue gas using a solvent that forms a temporary bond with the emissions, removing more than 90 percent of CO2 from a 240-megawatt slipstream. A reheating of the mixture releases carbon dioxide from the solvent, and CO2 can be piped out to Hilcorp's oil field. JX Nippon CEO Shunsaku Miyake said yesterday that he hopes the project can be replicated for other enhanced oil recovery, or EOR, developments. "In the future, we would like to develop this type of CO2 EOR project not only in Texas but also across the United States, and indeed globally, by applying" technical expertise gained through this project, he said, adding, "All of us who have supported this project must continue to cooperate in order to achieve our overall goal, which is increasing oil production and decreasing the emissions of CO2 into the atmosphere." CO2 for EOR is practiced largely in the Permian Basin oil patch of western Texas and southeastern New Mexico. Hilcorp CEO Jeffery Hildebrand said the technology will be used to bolster marginal wells at West Ranch, about 80 miles from the Petra Nova site. "The West Ranch field is getting a new lease on life," he said. Perry, speaking at the Petra Nova site yesterday, said there isn't a better example of a public-private partnership than what he witnessed there. He didn't directly address how potential federal budget cuts could affect projects like Petra Nova. It's a "tremendous example of how investments in clean technology can also lead to increased development of conventional sources of energy," he said. Perry added that the environment and the economy don't have to be on different sides. Abbott, Texas' governor, tied Petra Nova to the state's history of oil production. He expressed appreciation for having "this transformative technology" in Texas, reviewing how carbon dioxide as a byproduct of electric generation is harnessed to boost oil output. "The reviled CO2 is being captured and put to use doing what Texans know best how to do, and that is to produce even more energy from our oil fields," he said. Balanced Energy for Texas, which includes coal and electricity interests, joined the applause for the Petra Nova project yesterday. The "project is symbolic of Texas' role as an energy leader," Michael Nasi, Balanced Energy's general counsel, said in a statement. He said Perry and Abbott "understand the great potential of projects like Petra Nova to develop technology that improves lives with markets, not mandates." Nasi also said the significance of technology at Petra Nova can't be overstated because it "moves us closer to the ability to both address the carbon issue and meet global energy needs." Still, Hirs at the University of Houston said higher oil prices will be needed to make projects like Petra Nova work. Crude was priced higher when the project was discussed several years ago. "Just doing projects to break even is not a good use of capital, and shareholders will reject that" at some point, Hirs said. If another carbon capture project were to move forward at NRG, Greeson said it also might "need to be in somewhat reasonable proximity to oil" that could respond to CO2. "Fortunately, a big swath of the United States has that," he said.